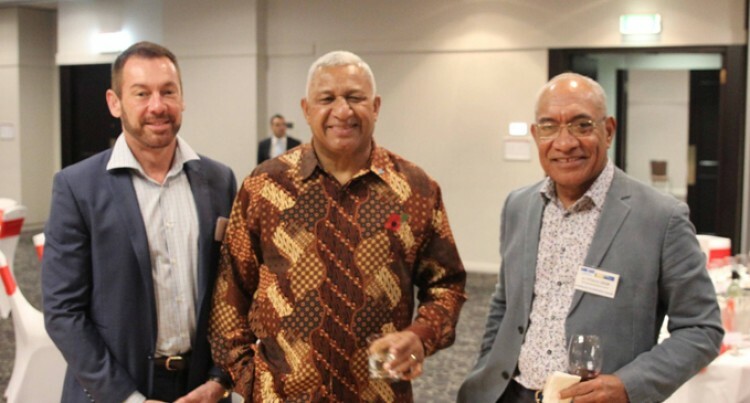 Prime Minister Voreqe Bainimarama (middle) with Australia Fiji Business Council President, Greg Pawson (left) and Fiji Australia Business Council President Viliame Leqa during the Australia Fiji Business Forum Reception at the Novotel Manly Pacific Hotel in Sydney on Thursday evening. weather events that pose such a serious threat to Pacific island nations,” he said. “We still aren’t satisfied with the PACER Plus Agreement. “One cannot negotiate such an agreement let alone sign it when the fundamental premise of the proposed agreement fails to take into account the ground realities of the economies of small island developing states. “Such an agreement must recognise the power differentials and the economic capacities between countries such as Australia and New Zealand on the one hand and on the other Pacific Island states that lack comparatively the economic sophistication and economic strength. Mr Bainimarama said Fiji was still irritated by certain impediments to trade such as the Australian ban on imports of Fijian kava. “Yet none of this should be an impediment to a higher and more friendly level of engagement between us and better relations generally,” he said. Mr Bainimarama also met and acknowledged the newly-appointed Australian Minister for International Development and the Pacific, Steve Ciobo, who has specific responsibility for the Pacific. The appointment has been seen as a clear sign of a renewed commitment by the Turnbull Government to give the island nations a higher priority. Mr Bainimarama also met the Australian Foreign Minister, Julie Bishop, describing the transformation in the tenor of the relationship to a much more positive note. “And from my perspective and that of the Fijian Government as a whole, you can be sure that we will match that commitment to a better relationship with sincerity and good faith,” he said. Mr Bainimarama noted that Australia is also the biggest foreign investor in Fiji and the biggest aid donor – some FJ$88 million in 2015-16. In addition, there is a flow of goods and services worth more than FJ$3 billion a year between the two countries. Mr Bainimarama told the business communities of both countries of their important role as principal economic drivers of the relationship between Fiji and Australia. “Australian business people trading and investing in Fiji are of course making handsome profits,” he said. He noted were Fijian business people trading and investing in Australia as well and the dual citizenship Fiji now offers was helping with further investment. “The climate to do so has never been better – the longest running period of economic growth in Fijian history,” he said.